Smartphone Screen Time: Baby Boomers And Millennials #infographic ~ Visualistan '+g+"
Millennials have a reputation for being glued to their devices. But does their smartphone use really differ that much from other generations? To find out, Provision Living surveyed 1,000 millennial and 1,000 baby boomer iPhone users. Each respondent was asked to go into their screen time settings and record their average daily screen time. They were then asked to record the amount of time spent on their most frequently used iPhone applications. The study revealed that both generations have similar patterned phone use—from the total amount of screen time logged daily to the most time-sucking apps. The average person spends 5.4 hours each day on their smartphone. 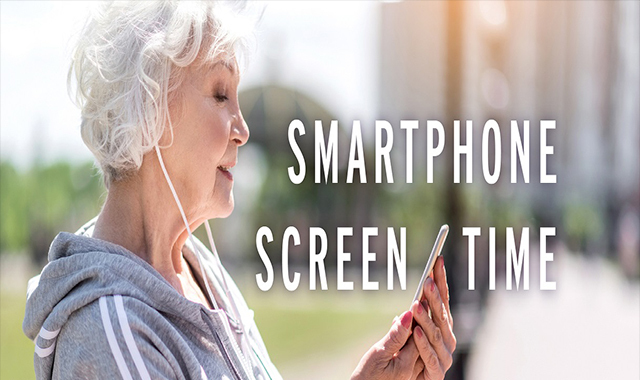 Breaking that down by generation: baby boomers spend an average of 5 hours daily on their phones, only slightly below millennials who clock in at 5.7 hours of daily screen time. The figures seem like a lot. In fact, they surprised 82 percent of respondents who thought their daily usage would be below that national average of 5.4 hours. So where does the time go? Both generations’ responses indicated that social media consumes the bulk of their daily screen time. Millennials log an average of 69 minutes a day on their Facebook app, while boomers are right behind them logging an average of 60 minutes on Facebook. Both generations’ second most popular app is Instagram, with millennials recording 52 minutes on Instagram daily, and boomers logging 44 minutes. From there, the generations start to differ. It may come as no surprise that millennials’ third most time-absorbing application is text messaging. Young adults spend three quarters of an hour messaging people they know, and an additional 41 minutes, on average, talking on the phone. Baby boomers, on the other hand, spend their time using e-mail and messenger apps before sending text messages or talking on their phone. At the end of the day, both generations spend a fair amount of time surfing the internet on their phones. Nowadays, roughly 60 percent of adults use their smartphone as their primary internet service provider. Americans have grown accustomed, if not dependent on their smartphone. That overwhelming majority of respondents, some 94 percent, believe that smartphone addiction is a real thing. People have a hard time being away from their devices, fearing missed calls and messages even in the middle of the night. The survey revealed that nine out of ten people sleep with the phone within arm’s reach of them in bed. Even after learning just how much time they spend each and every day, staring at, watching and listening to their devices, two in three people say they have no plan to cut back on their daily screen time. Apple has tried to draw attention to people’s apparent dependency on their smartphones by creating pop-up alerts tracking whether a user’s screen time is “up” or “down” from previous weeks. But this study revealed that even with that information, consumers are still going to type, talk, watch, Tweet, and everything else under the sun on their phones without any major concerns.